It's been a few months since we last posted about social media, and in particular, Google+, which made pages for businesses, organizations and topics available in November. We're back with an update on what has become possibly a favorite new means of connecting, sharing and finding new and interesting content... Google Plus is up there with another new favorite- Pinterest, the virtual pinboard that's getting a lot of press lately (more on that in another post). From the perspective of an individual (+lauren moss) and page administrator (+Architect | MYD), G+ is a great source of new information, where users are often highly active. In particular, the communities of artists, photographers and designers are very engaged, sharing projects, work and ideas that aren't the repackaged and repurposed posts that one tends to see on the more prominent websites and design blogs. In fact, many of those sites aren't active on G+, which allows for individuals and small sites to gain a following, and that following is based on the value of the content itself and the level of interaction of the user or page. Therefore, in spite of the learning curve, the logic is pretty simple: get involved, share, interact, and other plussers will do the same back. This type of environment creates a truly 'social' network, with users from all over the world not only sharing content, but circles and their contacts as well, expanding shared spheres of influence. 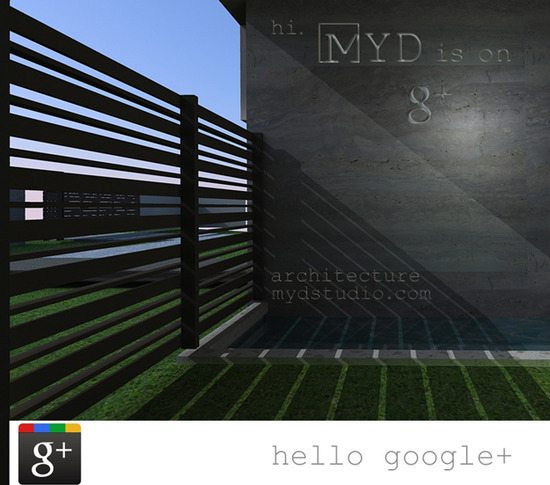 It's worth noting that although our page represents MYD as an architecture firm, we do not use Google+ (or any social media outlets, really) for marketing purposes. It could be the nature of the practice or our approach to obtaining projects, but social media is a means to learn, share, and find inspiration, and that's the basic extent of our goals. So, if you're looking for instant gratification, an immediate return, or an outlet to promote products, Google Plus might not be the place for you, but if you're engaged, patient and willing to put in the time, you will get more out of it (and a different experience) than that of other sites. For further technical guidance, there are countless resources on how to best implement G+; a search will yield over 1.5 billion pages on the subject. Additionally, you can go straight to the source and find pages dedicated to best practices and how to add circles, create albums and all that fun stuff. Thanks for stopping by, and hope to see you in our circles!